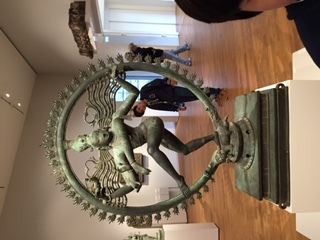 As we tour Europe, a recurring theme is who defeated whom when and how. I always wondered why Napoleon was popular among the Germans he vanquished; so popular that Beethoven dedicated his third symphony to him before he realized that Bonaparte was fashioning himself as an emperor rather than a deliverer on the principles of liberty, equality. 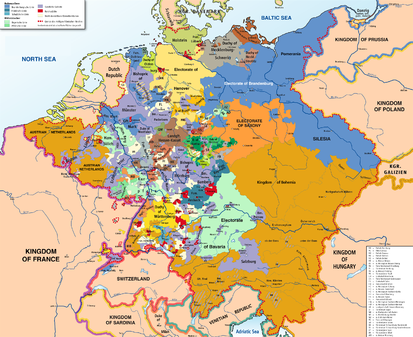 The reason for his popularity lies in the thousand year old Holy Roman Empire and what it meant to all those who lived under serfdom of many small duchies. When Napoleon oversaw mediatization and secularization, it presented a hope for greater social as well as geographical mobility in the new world order that appeared to be emerging. 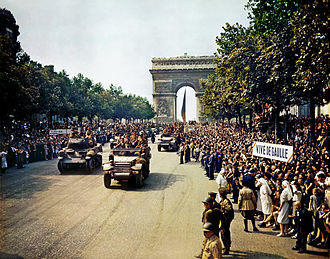 After the definitive victory over the Holy Roman Empire, they constructed the Arc de Triomphe to commemorate the Grand Army’s victory (most of which would soon be lost in the Russian Winter campaigns). Was it good or bad that Napoleon waged a war of aggression across Europe? Well, Nietzche brings up a good point about getting “beyond good and evil”. It is a matter of perspective. Napoleon had a “will to power” and that will reshaped the continent and hastened an era of modernity and greater freedom for common people. 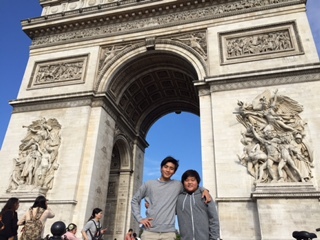 When we look at the iconic images surrounding the Arc de Triomphe, we realize that the destruction and reorganization from war can always be viewed as a positive or negative depending on which perspective you take. 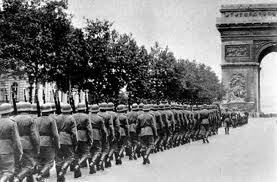 Over a century later, to Vichy collaborators, this advance of the Army of Third Reich may have seemed like a reunification of Europe under a strong rule, but most would have had deep sadness and fear over the destruction of the French Army. 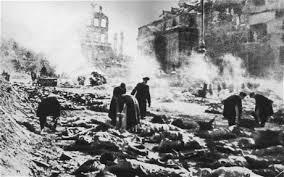 When the Allied forces marched back, it would have seemed like a triumph of the forces of good over evil. But the truth is, war represents only a reshuffling of power and the wealth that it projects. 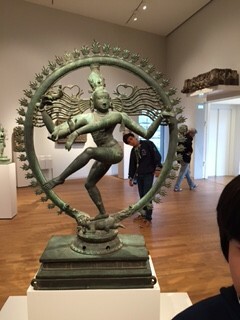 That is why the Hindu god Shiva represents both destruction and creation. I have seen a similar creative destruction in patients taking telomerase activators. They often get soreness in ligaments followed by remodeling and healing. This is in keeping with my Stem cell theory of Aging and Disease that you can read more about here. In our systems of stem cell maintenance, we do not have high error correction and high proportions of immortal stem cells, like the jellyfish or the lobster, that can grow and molt indefinitely. For that reason, we need creative destruction, or a vanquishing of damaged stem cells, with their overgrown telomere ends, before those niches can be filled by newer ones from a reserve of mesenchymal stem cells. That is why I believe the first year of telomerase activation is often accompanied by a net decrease in the mean telomere length, because the older, partially senescent and stubborn stem cells, like WWI Polish cavalry and antiquated tanks, are cleared out in favor of Panzer divisions. But in a system that is youthful and optimized, like the United States before Pearl Harbor in 1941, the violence of WWII mobilizes industry, soldiers, and political will in a way that can prove rejuvenating. The American Century was further ensured by the delay of German and Japanese industry in the post war landscape that was allowed by massive infrastructure damage and American rebuilding that took place during the early Cold War period. Turning back to triumphs and tragedies in our aging bodies, let’s look at the war in one of our patient’s bodies. 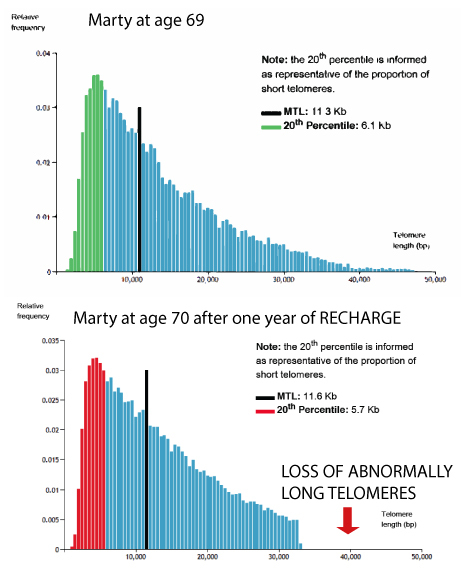 In the case of Marty, a 70-yo who took RECHARGE for a year, his average telomere length increased by 300 base pairs, or roughly 6 year’s worth assuming a rate of 50 bp/year of attrition. But when you compare the histograms, we see that this gain was despite the dramatic loss of the overgrown telomere ends that used to be present at the <30,000 base pair range. So the median telomere length didn’t change a lot but the mean would have. I believe, as I explain in this blog, that apoptosis in overgrown and senescent stem cells accounts for the rather discouraging drop in median telomere length in many patients after the first year of telomerase activator usage. But the better performance in the absence of higher rates of cancer, represents an overall benefit for the system as a whole. The triumph of the strong after the vanquishing of the weak is morally ambiguous but in the case of long-term survival of the organism, it may be a regenerative process, like the hormesis involved with low level radiation that I blogged about here. I believe adaptogens like RECHARGE allow ailing stem cells to complete self-annihilation and pave the way for improved replacement stem cells if they are still available in the reserve. So creative destruction is part of a natural system of stem cell maintenance in the absence of the ability or the desirability of growing to gigantic proportions.